What do you get when you cross children’s interior decorator extraordinaire Sissy + Marley with the amazing hand screen printing prowess of designer Jill Malek? You get the most divine wallpaper you ever did see, that’s what. 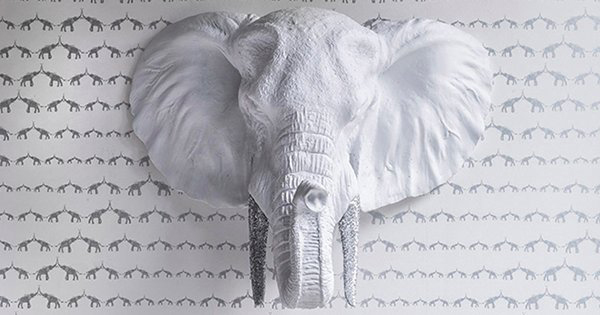 Click on through to see how this collaboration of designers are taking walls from drab to fab! With the most amazing of portfolios to back them up, we’re not surprised to fall instantly in love with their collaborative venture, Sissy + Marley For Jill Malek wallpaper. I believe nothing changes the look of a room quicker and with more oomph than wallpaper and this collection is stunning. Both contemporary, fresh and young, children will undoubtedly love it as much as their parents. There are several premium wallpaper designs available in the Sissy + Marley For Jill Malek collection – Giraffe, Baby Elephant Walk, Lucky Star, Jam and, my personal favourite, My House. All wallpapers are expertly hand screened and available in at least two colour choices depending on your chosen design, but all offer an exquisite metallic finish option for a rather glam look indeed! Sissy + Marley For Jill Malek wallpapers are priced US$170 per drop (71cm x 4.57m) and available from Jill Malek.